Responsable del tratamiento: Real Homes in Real Spain, Finalidad del tratamiento: Gestión y control de los servicios ofrecidos a través de la página Web de Servicios inmobiliarios, Envío de información a traves de newsletter y otros, Legitimación: Por consentimiento, Destinatarios: No se cederan los datos, salvo para elaborar contabilidad, Derechos de las personas interesadas: Acceder, rectificar y suprimir los datos, solicitar la portabilidad de los mismos, oponerse altratamiento y solicitar la limitación de éste, Procedencia de los datos: El Propio interesado, Información Adicional: Puede consultarse la información adicional y detallada sobre protección de datos Aquí. Distance to beach: 55 Mins. Distance to airport: 35 Mins. Distance to amenities: 2 Mins. Distance to Golf: 35 Mins. Completely restored character stone country cottage style property with new automatic swimming pool, garden terraces, terraced olive groves and ample parking with private gated entrance and boundaries fenced. The 9,000m2 plot could be an ideal location to site Yurts etc and also can be an additional legal building plot to build a separate property with full planning permission available. Comprising large shaded veranda with stunning views over the new swimming pool, mountains and historic Blanca town only five minutes drive to all amenities. Open plan lounge with log burning stove, sofa bed and flat screen TV, dining area and new fitted kitchen with appliances installed including ceramic hob, electric oven, fridge freezer, washing machine and electric water heater. Two bedrooms, one with large fitted cupboard, modern fully fitted shower room. All new electrics, plumbing, windows, doors etc. Fully furnished, includes all appliances, ready to enjoy immediately. A very unique opportunity to acquire a superb key ready property in a very private and peaceful location with 360º stunning views. 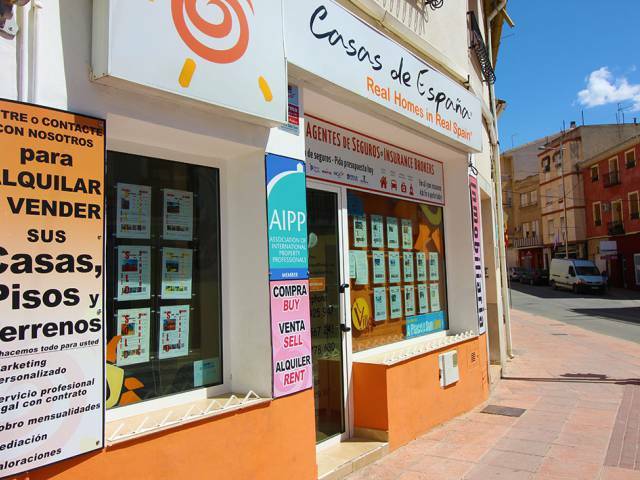 Our estate agent started in 2003 following a philosophy of offering the best houses in the Ricote Valley – Murcia. We’re a small, family run, limited company whose aim is to offer a unique and personal service to all our clients: professional sales of property, land for single- family homes, full reforms, etc. Real Homes is formed by a team that combines local professionals, with their specialized local knowledge and experience; with English speaking employees. Get in touch with us, so that we can advise you on the best option for your relaxation and well-being. We will provide you with all the necessary support, so that you may find your dream property in Spain. The badge of AIPP membership is a reminder to you, the consumer, that a company must follow professional standards and act with honesty, integrity and transparency. When you see that a company is a Member of the AIPP, it means that they have been vetted and approved, and that they have voluntarily agreed to follow and be bound by the industry Code of Conduct.